As a tide of green leaves transforms the landscape each spring, a near limitless smorgasbord of food is offered up to leaf munchers of all kinds. Among the most noticeable of these are tent caterpillars. Eastern tent caterpillars – the ones that make an actual tent – were especially abundant in the Kawarthas this spring and stripped both apple and cherry trees of their leaves. 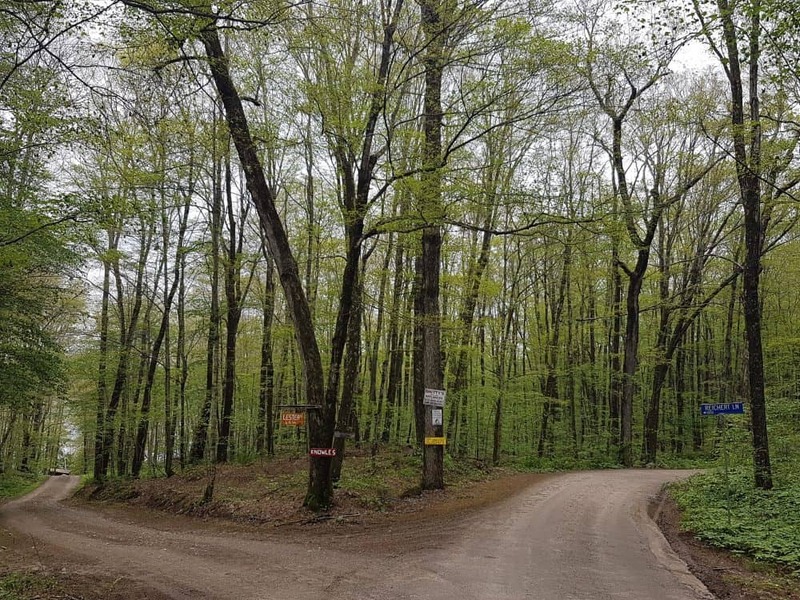 In the Ottawa area and in Frontenac County near Bon Echo Provincial Park, closely-related forest tent caterpillars have defoliated large expanses of deciduous woodlands. This has caused people to ask, “Why are there so many caterpillars all of a sudden?” This week, I’ll try to answer this question and provide an overview of the fascinating natural history of these two species. The eastern tent caterpillar (Malacosoma americana) is the species people are most familiar with. It spins the well-known silken tent we see in the crotch of apple and cherry trees. 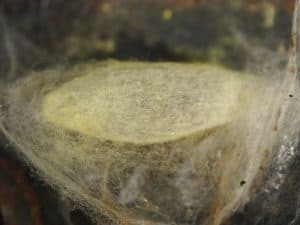 Eastern tent caterpillars emerge in mid-May from “varnish-coated” egg masses wrapped tightly around the twigs of their host trees. 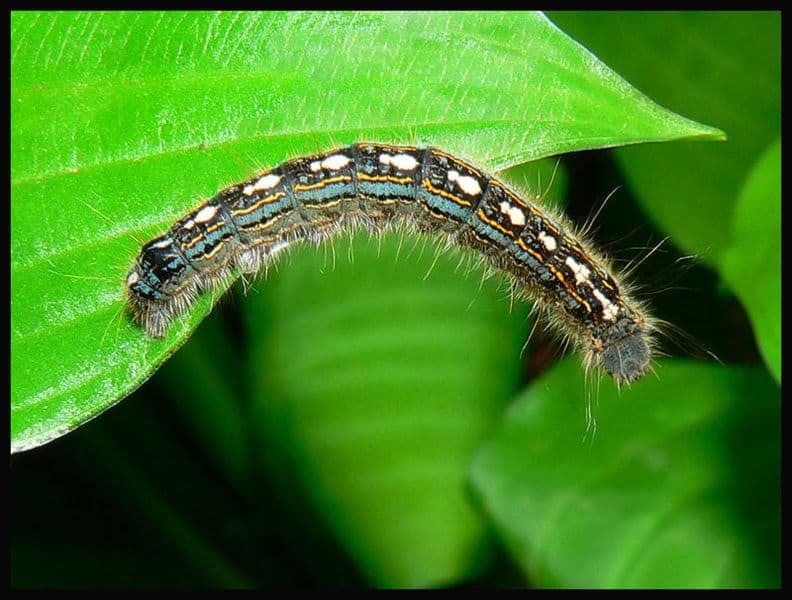 The caterpillars are hairy, with blue, white, black and orange markings and a white line down the back. They exit the tent three times during the day to feed – before dawn, in mid-afternoon and just after sunset. The tent is used only for resting, protection and for heat regulation. They have a layered structure, which allows the caterpillars to adjust their temperature by moving from one layer to the next. Even though they may completely defoliate their host tree, new leaves emerge soon after and the tree usually recovers. When fully grown, the caterpillars spin a cocoon in some sheltered location. By summer, they will have transformed into three centimetre-long, reddish-brown moths with two pale bands on each fore wing. Like its tent-building cousin, the forest tent caterpillar (Malacosoma disstria) is dark with blue stripes down the sides. Along the centre of the back, however, it has distinctive markings that resemble tiny snowmen. 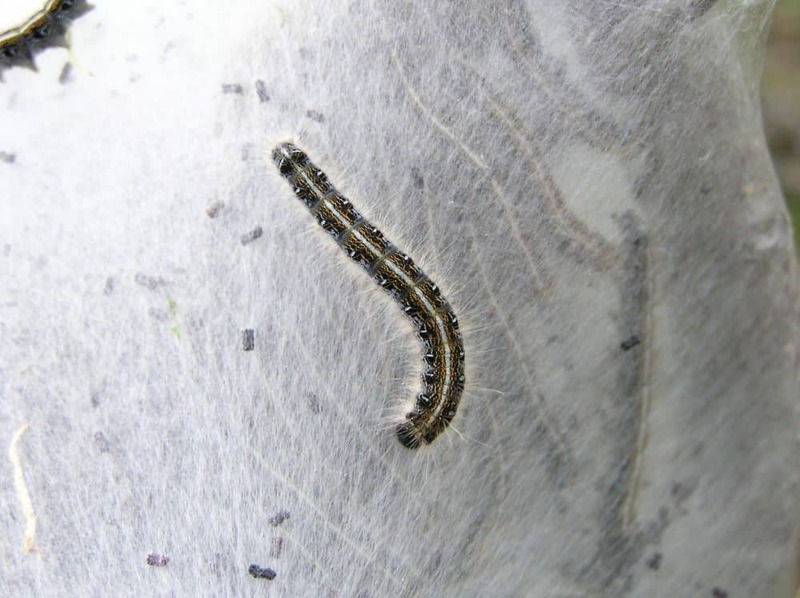 The timing of events in a forest tent caterpillar’s life cycle varies from year to year. This year, caterpillar development was a little later than usual because of the relatively cool spring weather. The eggs hatch and caterpillars appear as the buds open on their host trees, usually sugar maple and red oak. In central and eastern Ontario, this is usually in early to mid-May. Once the host tree is defoliated, however, they wander widely in search of more food. This often takes them over roads, where they can become a slippery hazard when motorists apply their brakes. As the caterpillars wander, they lay down a scent trail, which is deposited as part of the abdomen drags against the ground or other substrate. The rest of the colony follows the scent trail to the new source of food. These caterpillars also set down silk trails, which help them to adhere better to the leaves and branches where they are feeding. When the light is right, it is possible to see hundreds of these silk highways in the treetops. The larvae go through five growth stages called instars and can reach nearly three centimetres in length. Each instar takes seven to ten days to complete. Depending on the weather, the larval stage can last until late June. It is common to see 50 or more of these caterpillars clustered on pads of silk spun on leaves or on shaded bark surfaces. These are known as bivouacs and are used for resting and for heat regulation. In the case of eastern tent caterpillars, the tent itself serves as a bivouac. This is a good time to remove the caterpillars if you are concerned about your trees. Having completed the fifth instar, the caterpillar seeks out a leaf, the side of a building or some other structure on which to spin a cocoon. 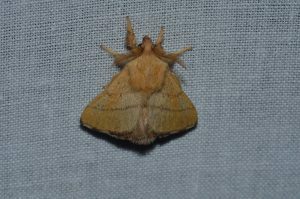 The yellow cocoons are covered by loose silk webbing and are a familiar sight to many cottagers. The cocoon is impregnated with yellow crystals of calcium oxylate, which are secreted by the caterpillar. The caterpillar then transforms into a black and grey, hard-shelled pupa inside the cocoon. This past weekend, my wife and I removed dozens of cocoons from the walls of my brother’s cottage on Big Gull Lake, near Bon Echo Provincial Park. The calcium crystals blew off in the wind like dust. Seven to 10 days after entering the pupal stage, the adult moth emerges. Forest tent caterpillar moths are similar to their “eastern” cousins, but the lines on the forewings are dark instead of pale. These moths are night flyers and come to lights in large numbers. After mating in early to mid-July, the females lay several clusters of 150 -200 eggs on the twigs of host trees like sugar maple and red oak. The clusters form a dark ring around the twig and are easy to see, especially in the fall after the leaves drop. They are anchored and protected by a bronze-coloured sticky substance called spumaline. It forms a casing, which protects the eggs from drying out. The eggs easily survive Ontario winters, even when temperatures drop to -30 C or colder. After laying their eggs, the moths soon die. During large infestations, broad-leaved trees can be completely defoliated over large areas. Aspen are the preferred trees, although they will readily feed on other hardwoods, too, such as birch, basswood, oak and sugar maple. One exception is the red maple, which is not attacked by the caterpillars. I also noticed this past weekend that dogwoods, serviceberries and ironwoods had escaped the caterpillars’ wrath. Many of the oaks, birches and aspens, however, had been stripped of nearly all their leaves. Most trees can survive several years of defoliation and will produce new leaves within three to six weeks. During outbreaks, the biomass (total weight) of forest tent caterpillars outweighs that of the collective biomass of all other animals in the forest. Dr. Jens Roland, of the University of Alberta, estimated that the weight of caterpillars in a square kilometer of aspen forest is equivalent to that of 657 caribou! Like the eastern tent caterpillar, forest tent caterpillars are a native species. 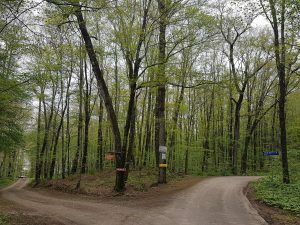 Outbreaks are therefore a natural event in the forest ecosystem and occur regularly. The actual cause of a given outbreak, however, is not well understood, nor can the interval between outbreaks be predicted. They do not necessarily occur “every ten years or so”, despite what many websites say. From 1867 to 1987, province-wide outbreaks occurred in Ontario at intervals of 9-16 years. Caterpillars remained in outbreak numbers for 1-8 years (average 3 years). Some areas, however, seem to be able to go outbreak-free for decades. This means that historical data cannot be used to predict when an outbreak will occur or how many years it will last. This reflects the randomness of the elements that come together to cause population explosions. Clearly, more research is needed. Although populations of forest tent caterpillars may expand for several years in a row, they inevitably collapse. They are naturally regulated by factors such as late spring frosts, bird predation – cuckoos love them – and parasitic and predatory insects. Climate change, too, may work against them as increasingly warm winters can cause the caterpillars to emerge too early in the spring. If the eggs hatch too many days before the leaves emerge, the caterpillars can be left with nothing to eat and die from starvation. The downside, however, is that caterpillar mortality means far less food for the migrant bird species that return later in the spring. The forest tent caterpillar’s worst enemy – and probably the main factor in stopping an outbreak – is the large flesh fly (Sarcophaga aldrichi), another native species. 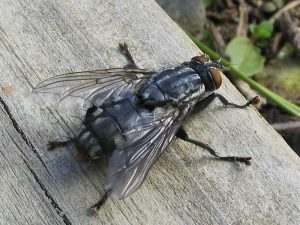 In early summer, flesh flies emerge from pupae in the ground and fly about looking for forest tent caterpillar cocoons. Right out of a horror movie, the female fly gives birth to a live larva (maggot), which it deposits on a cocoon. The larva then bores into the caterpillar pupa, feeds on its flesh and eventually kills it. The maggot then drops to the ground where it overwinters, pupates and emerges as an adult the following year. Flesh flies can destroy over 80% of the caterpillar pupae in a given season. This means their impact doesn’t become apparent until the following spring when caterpillar numbers are much reduced. The fly population, too, crashes because there are far fewer caterpillar pupae to feed on. Flesh flies are black or dark grey with three black stripes on the thorax, similar to house flies. However, they are larger and have a checkerboard pattern on the abdomen. Their numbers often explode in the years following a caterpillar outbreak and people wonder where all the annoying flies suddenly came from. Although they like to land on people, animals and food, they don’t bite, nor do they spread disease. People sometimes wonder if they’ve been released by a government agency, hence the name “government flies” in some areas like New York state. This, however, is not the case. The flies are simply evolution’s response to an abundant food source! It’s hard to predict when the next forest tent caterpillar outbreak will occur in the Kawarthas. Given outbreaks in eastern Ontario, however, it might be soon!